Creative Woodturner is so easy for woodturners to use. 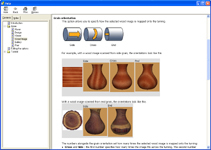 As a woodturner you won't want to spend hours learning how to use the software - so we have made it very easy to design your woodturnings. 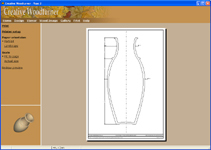 The software works in the same way that you would plan any woodturning project - you draw the turning, choose the wood, then print the plans to take to your lathe. The tutorial gets you using Creative Woodturner in no time at all. The tutorial takes you step-by-step through a project to design a woodturned bowl. This teaches you all the steps needed to create your own woodturning projects. Creative Woodturner has a different page for each stage in the woodturning design process. By working through the pages, you are introduced to the functions of the software as you need them. 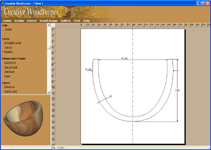 The design page is where you draw the shape of your woodturning. The automatic-mirrored center line and instantly updated 3D view make it as easy as possible to draw your woodturning. 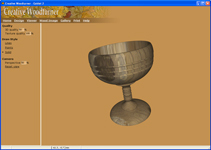 On the viewer page you can see a large, photo-realistic image of what your woodturning will look like. You can rotate and zoom the image to look at your woodturning from different angles. 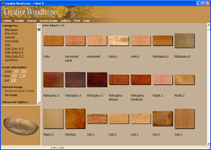 A selection of over 140 images that you can choose for your woodturning are shown on the wood image page. The gallery page displays your woodturnings separated into categories. You save your own woodturning designs in the gallery, and are displayed with a small image so it's easy to find your designs later. 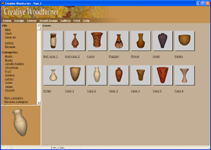 The software comes with over 60 woodturning designs included. Finally, the printing page is where you can print your woodturning designs and take them to the lathe. 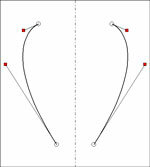 Draw your woodturning using either the straight line or curve tools. These easy to use tools involve just one click-and-drag to draw on the design page. The save, undo and redo functions make it quick to learn without worrying about losing your work. Should you need any help using Creative Woodturner, the help pages provide clear and concise help on all of the functions in detail. It is easy to send your woodturning designs to other users of Creative Woodturner, for example by e-mail or posted on the web.